Winner: Royal Society of Literature W.H.Heinemann Prize 2002. On 11 April 1987 the Italian writer Primo Levi fell to his death in the house in Turin where he was born. More than forty years after his rescue from a Nazi concentration camp, it now seemed that Levi had committed suicide. Levi’s account of Auschwitz, If This is a Man, is recognized as one of the essential books of mankind. No other work interrogates our recent moral history so incisively or conveys more profoundly the horror of the Nazi genocide. 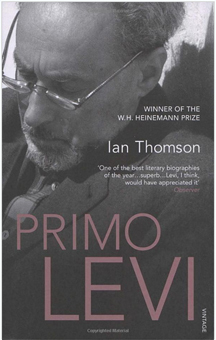 Ian Thomson, one of the last to interview Primo Levi, spent over ten years in Italy and elsewhere researching and writing this rich and definitive biography. New light is shed on Levi’s recurring depressions and vital information is unearthed regarding the writer’s premature death. This matchless book unravels the strands of a life caught between the factory and the typewriter, family and friends. “A model of its kind: beautiful in its arrangement and narration, measured and honest without ever being remotely dull. Thank goodnesss for Ian Thomson… over and over again it is Thomson who proves himself, through his precision, modesty and intelligence, the true and perfect biographer of Primo Levi”. “Wonderfully perceptive on so many levels, it is all the more remarkable that this biography was written by a man who is neither Italian nor Jewish, born 16 years after Levi’s release from Auschwitz. Thomson’s account of Levi’s wartime experience is graphic and chilling… This book is so beautifully written, so precise in its construction, that it is a joy to read”.